Be it man's urge to placate the Gods above or to quench his desire for adventure, Gangotri is an ideal location. Gangotri, the origin of the sacred river Ganges, attracts tourists in large numbers every year. The confrontation with the daunting rivers and attempts to unravel the mysteries of the supernatural world are ubiquitous sights here. Along with the thrill of conquering nature, what one experiences here is the mystical aura that India is so famous for. Couched in the magnificent Garhwal hills, Gangotri is at an altitude of 3048 meters above sea level. Gangotri is situated in the northernmost part of the state of Uttaranchal and is very near the Indo-Tibetan border. It is approximately 300 km from Dehradun, 250 km from Rishikesh and 105 km from Uttarkashi. The summers are relatively cool and winters are freezing cold, with rains in the months of May and June. For the devotees and tourists, the gates of the temple are open only in the months of May to November. According to an old legend, Lord Shiva rewarded King Bhagirath after his penance and Ganga came down to earth. However, due to her pride, and the fact that the earth would be devastated if Ganga came down in her full force, Lord Shiva caught her in his locks. It was then proclaimed that Goddess Uma or Parvati, Shiva's consort, would bathe in the Ganges daily and only then would she descend on the earth. The sacred stone near the temple denotes the place where Ganga first came down to earth. This is why Ganga is also called by the name of Bhagirathi. 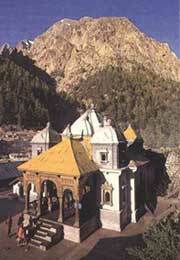 The shrine of Gangotri is around three centuries old. It was renovated in the 20th century and is a 20-feet high structure of white granite. During the winters the statue is taken to Mukhimath village for six months, where it is worshipped. There is a natural rock Shivling (Shiva worshipped in his phallic form, as the originator of life) as well. It is called the Jalamagna Shivling. This is the place where Lord Shiva received Ganga in his locks. It is visible only during winters. The most famous site nearby is the Gaumukh (literal meaning, cow's mouth) glacier, which is at an altitude of 4200 meters above sea level. 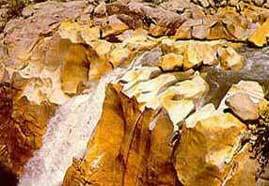 It is the geographical origin of the Ganges and is at a distance of 18 km from Gangotri uphill. The Ganges is called the Bhagirathi here. At a distance of 28 km from Gangotri is Cheedvasa, where one can pick up local artifacts. Bhojvasa, at a distance of 22 km, is an ideal camping site. Nandanvan is a 6-km tough trekking route along the glacier and gives a view of the Shivling. Across the snout of the Gangotri glacier is the sylvan Tapovan, which is known for its exquisite verdure encircling the base of the Shivling peak. From here, one can go to Vasuki Tal, Kalindikhal, at a height of 5590 meters and reach Badrinath. En route Uttarkashi, at a distance of 9 km from Gangotri, is the Bhairon Valley, at the confluence of the rivers Bhagirathi and Jat Ganga and is famous for its temple dedicated to Bhairavnath. Also on the same route is Dayara, at a distance of 90 km from Gangotri via Bhatwadi, which is a newly developed snow sports complex. At a distance of 53 km from Gangotri is the place known for its hot water springs, Gangnani, which is at an altitude of 1855 meters above sea level. At a distance of 97 km from Gangotri is the pilgrimage spot of Uttarkashi. It is known for its Vishwanath and Kuteti Devi temples. Maneri, at a distance of 108 km from Gangotri, is a powerful electricity station. At a distance of 18 km from Gangotri is Kedartal, which serves as a base camp. Dodi Tal is a nearby lake. Harsil is 25 km from Gangotri and is perched at a height of 2620 meters above sea level. It is well known for its resorts. There is the Wilson Cottage, built in 1864, which is often visited. Sat Tal or the seven lakes is wonderful sight and is near the village Dharali (20 km). The nearest airport is that of Jolly Grant, which is approximately 270 km from Gangotri, via Rishikesh. The nearest railway station is Rishikesh, to which one can get trains from Dehradun and Delhi. There are daily bus services from Gangotri to Rishikesh, Hardwar, and Dehradun. Jeeps and tempos are available from Rishikesh to Gangotri.